The goal of every sport is to go better, further, faster. Every human has natural limitations though, and in order to improve they turn to sources outside of themselves to gain every advantage they can. In pursuit of this, swimming companies have come up with some pretty amazing products to help you shave that extra second off your lap time. These are designed to train your hand position in strokes to achieve highest efficiency. They are lightweight and non-cumbersome. The best part about them is that they have no straps to keep them attached to your hands—the only way to hold onto them is with proper technique or else they fall away. Everyone enjoys the extra speed a normal pair of fins adds to their swimming. But the traditional fins never really worked for the breaststroke kick. 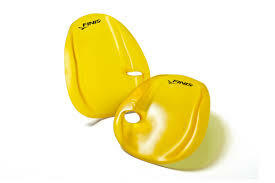 These new fins from Speedo are designed specially for the breaststroke. They help to hold your feet in the proper position to help teach the whip kick faster or hone the technique of a long time swimmer. 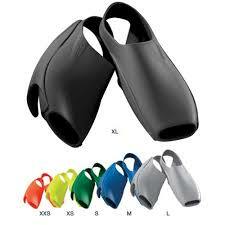 If breaststroke is your stroke of choice, then these fins are for you. 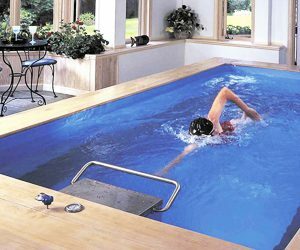 These are small pools designed for personal use. They create a current to swim against so you can swim forever but go nowhere. They’re like the treadmill for swimming. You can even add a treadmill to the bottom of the pool. They are great for personal training and are small enough for a home (although they’re rather pricey). Michael Phelps and many others wore this suit at the 2008 Beijing Olympics. At those Olympics, 94% of the swimming races were won wearing this suit. This suit is made from an advanced water-repelling material that is also designed to hold the body in the most streamlined shape while increasing oxygen flow and buoyancy. After the Beijing and before the London Olympics though, it was decided these suites were the equivalent of “technological doping.” This caused FINA to crack down on swimsuit rules and they effectively banned the LZR from races. Speedo’s new Fastskin line replaces the LZR. The cap itself was designed after head mapping studies and fits the most comfortably and tightly of any swim cap. Combining the swim cap with the Fastskin goggles and suit gives you the highest tech swim system out there—and Speedo makes sure to let you know that this one is FINA approved. Arena offers many different models of goggles, but they all use a combination of intriguing features. They offer interchangable nose bridges (the piece that holds the two lenses together): a soft, adjustable nose bridge or a rigid piece, each with multiple sizes. Some goggles have flat lenses for focus or a split lens for better forward vision to help align your head correctly. 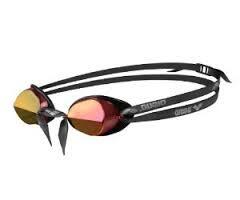 They also offer mirrored lenses, making them good for triathlons or any outdoor swimming. All of their goggles come with anti-fog coatings and UV protection. An up-and-coming workout tracker for swimmers. 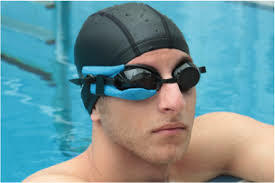 This nifty little gadget from Dubai attaches straight onto your goggles so as to not interfere with your swimming. It displays and tracks your heartbeat, calories, laps and flip turns. And when you’re done you can connect it to your computer via USB and analyze your performance on land. And of course don’t forget your Underwater Audio iPod shuffle! It’s waterproofed from the inside out and has enough capacity for several hundred songs. 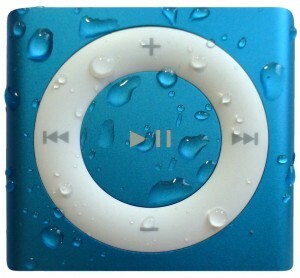 This waterproof iPod is perfect for keeping you engaged during your workout. What are your favorite swimming gadgets? What swimming invention do you wish you could buy? Let us know in the comments!